The chorus are guided through whimsical scenes charting familiar stages of life and rites of passage, meeting strange characters who help or hinder them from getting a glimpse of something beyond the ordinary, a little burst of light and life in the greys. 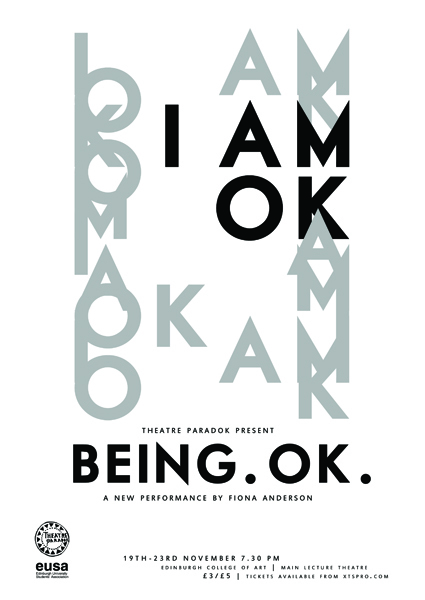 A devised performance exploring what it means to be OK. Directed by Fiona Anderson, presented with Theatre Paradok. This production brought together artists Fiona Anderson, Rohanne Udall and Kate Banks who would go on to create Good Punch. Performed, November 19th- 23rd 2012 at Edinburgh College of Art. Cast: Maria Kheyfets, Jodie Mitchell, Sam Irving, Freddie Alexander, Bonnie Calderwood Aspinwall, Maria-Nefeli Tsetseri, Isabel Palmstierna, Isabelle Debnan, Eva O’Connor, Agnes Torok and Sam Gillespie.